A method for electroplating titanium alloy coating into plastic and carbon foam comprises the steps of activating the given specimen, deposition of electroless nickel and electroplating process of titanium alloy to the surface of the specimen. The electroplating process of electroplating titanium alloy coating includes a direct current method and a pulse plating method. The direct current method characterized by lager sized grains and the pulse plating method characterized by smaller sized grains. The advantages of proposed electroplating processes are: a) low cost, b) very broad applications and c) relatively low number of the process steps. Unique combination of physical, mechanical and chemical properties makes the electroplating methods of titanium coating an attractive technology for medicine, biotechnology, sports, defense, aeronautic, and auto industries. 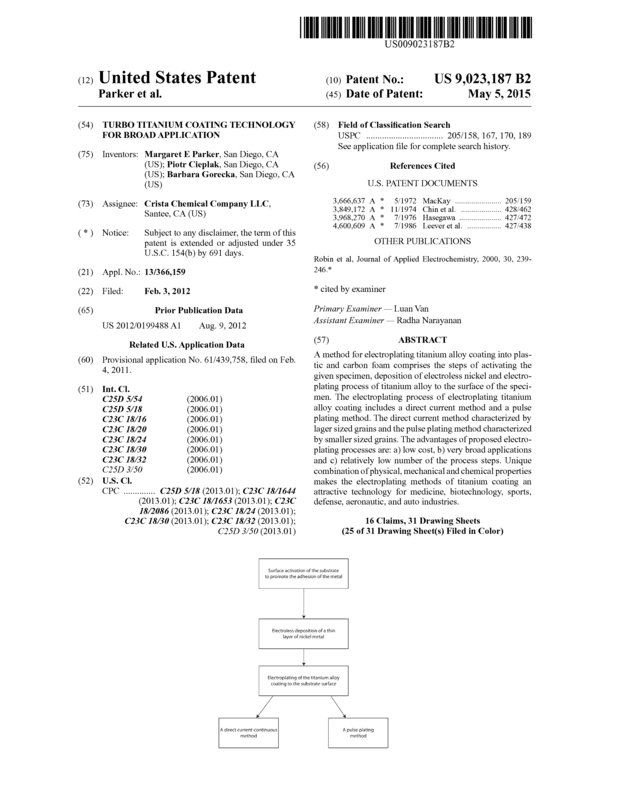 Sale the patent "as is"
Page created at 2019-04-25 4:06:44, Patent Auction Time.